A small and simple device, our fork truck fork caddy makes replacing forks much easier and much less dangerous. Simply slide fork into caddy and tighten locking screw. 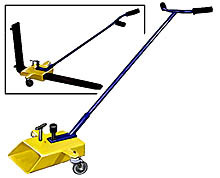 Transport fork to fork truck, turn caddy handle 90 degrees and slide fork onto truck mast. Sturdy casters make transport a breeze and the comfort-grip handle pivots up to 180 degrees for better maneuverability. Compact design stores out of the way.